As a kid in the US I attended baseball games with my family and football with my friends. In Canada, it was unthinkable to let a season go by without attending at least one hockey match. So when I came to Paris, it was only natural that I find “my” team to support. But first I had to pick my sport. The choice seemed natural . . . soccer. As an American, everyone already assumed that I was a “soccer mom”, so why not? The problem was, nobody in my bourgeois Paris neighborhood went to soccer games. Not to start a polemic here, but in France, they really do go by the old British saying, “Rugby is a game for barbarians played by gentlemen. Football is a game for gentlemen played by barbarians.” In the 7th arrondissement of Paris, the locals consider themselves to be gentlemen, so rugby is the sport they support. And it’s actually a fun game to watch, even if they are always throwing the ball backwards! If you’re already a fan, or would just like to see what it’s all about, a great place to catch a local game without heading to the stadium is Le Recrutement. They are so into their rugby that even the sign outside is a large neon rugby ball. Inside, the decorator ran with the rugby theme, tossing framed jerseys and other rugby paraphernalia onto the walls. The crowds come to watch the game and talk the game, making it one of the rare times that it is easy to strike up a conversation with locals. 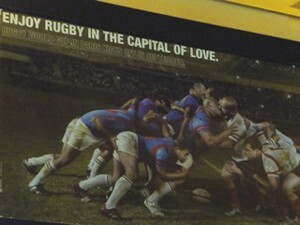 Another rugby café bar with a great scene is the more rough and tumble Au Métro . Here the crowd is more rowdy, but the food is more memorable, with specialties from southwestern France: confit de canard, cassoulet and even axoa (a veal stew). A quick peek at their website and you won’t be surprised to learn that this is where many of the Stade Français players come to celebrate (or mourn) after a match. 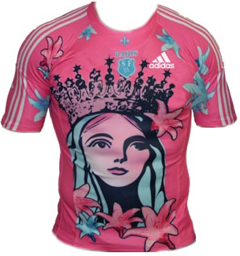 Stade Français  is the name of the local team and I believe they are the bravest team on the field because they are “man enough” to wear pink jerseys. Not only are they pink, but some marketing genius approved a large princess illustration across the front AND she’s wearing a crown! Not exactly a macho image, and probably hard to pull off unless you happen to be a 300-pound rugby man! Because this is France and all things linguistic must be confusing, the Stade Français plays at the Stade de France ; tickets can be purchased on their website and it is a direct, very easy RER B ride from central Paris. It’s a great place to catch a live match, and because alcohol cannot be sold within the stadium, it is a very calm, respectable crowd. If you’d like a souvenir, but their jersey isn’t fashionable enough for your wardrobe, there is nothing more popular that the DIEVX DV STADE (Stadium Gods) calendar that comes out each year. It’s like the Pirelli calendar, only for women like us—making me love rugby even more. For more irresistible finds in Paris please consult the Girls’ Guide to Paris .